Concussion is a minor traumatic brain injury that may occur when the head hits or gets hit by a moving object. The hit results in a condition of altered mental status, with or without loss of consciousness. There may be even a brief period of amnesia afer the blow. Concussion is pretty common, affecting about 128 people per 100000 population in the United States yearly (as NEJM reports), with young children having the highest rate. The causes of concussion are mostly car/bicycle accidents, falls and sports injuries. The term "concussion" comes from Latin concutere (to shake violently) or concussus (action of striking together). It is also called minor head trauma, mild brain injury or mild traumatic brain injury ( MTBI ). Concussion of a more serious grade may be followed by a delirious state and a period of sleep. Despite MTBI being a minor trauma, some symptoms, such as unequal pupils, remaining unconscious and convulsions, may require immediate medical attention, due to the risk of severe brain lesions, for example cerebral contusions as well as intracerebral, subdural and epidural hematomas, which represent neurosurgical emergencies. The relevance of the injury is evaluated on grading systems. The cerebrospinal fluid, which surrounds the brain, acts as a cushion, protecting from traumas. Severe impacts or forces associated with rapid acceleration may not be absorbed by cerebrospinal fluid, causing linear, rotational or angular movements of the brain. These movements and their combination during the impact are the basis for concussion. The injury generally occurs when the head either accelerates rapidly and then is stopped. This violent shaking causes the brain cells to become depolarized and fire all their neurotransmitters at once in an unhealthy cascade, flooding the brain with chemicals and deadening certain receptors linked to learning and memory. No physical swelling or bleeding is usually seen on radiological scans. The damages resulting from movements lead to the symptoms already described: for example, the loss of consciousness is due to the disruption of the normal cellular activity in the reticular activating system. Incresead levels of the excitoxin glutamate have been detected in association with reduced cerebral perfusion (which is linked to depression ) in humans after TBI (traumatic brai injury). Hyperglycolisis occurs as a pathophisylogical response to ionic and neurochemical cascades following TBI. The anatomical common denominator in concussion is the production of diffuse axonal injury. After the surge, the cells try to regain their equilibrium. This process takes time, although how long is impossible to predict: sometimes hours, sometimes weeks, sometimes never. The latest guidelines from the American Academy of Pediatrics suggest that most concussed subjects require at least 10 days to recover, with adolescents generally needing a few days more. While the brain is recovering there are a long list of side effects, including headaches, photophobia, depression, anxiety and difficulty remembering or focusing. The healing needs to be uninterrupted because in the aftermath of a concussion, the brain remains fragile and even a minor secondary impact can unleash a massive loss of neurons which can be permanent. The usual treatment is rest. Rest is necessary to avoid other concussions that may, as we have seen above, be very dangerous. Some analgesic can be taken to relieve the pain after the injury. The symptoms should leave within a week (it may take a couple of extra days for children and adolescents). However, if symptoms dwelt or develop, is warranted a immediate medical attention. Patients suffering from MTBI usually recovery very well, the symptoms totally fade within weeks and are seldom persistent. The mortality rate is almost zero and the outcome is usually excellent. However, many factor may change the overall prognosis, including age, brain injury history, intellectual abilities, occupational status and family environment. Repeated concussions may lead to cumulative effects on the brain, causing increased risk for pathologies such as dementia, Parkinson and Alzheimer’s and provoking disease that will be seen in this article. Neurologist say that once a person suffers a concussion, he is as much as four times more likely to sustain a second one. Moreover, after several concussions, it takes less of a blow to cause the injury and requires more time to recover. The most famous case of MTBI of recent years is the one occurred to Peter Cech , a Czech footballer who plays for Chelsea and Czech Republic as goalkeeper. On 14th October 2006, Cech was hit by an opponent in the head and suffered from a severe concussion that kept him away from the field for almost 100 days. Since then he wears a special leather helmet to protect his head from this kind of injuries. Repeated concussion, especially during young age, may lead to a variety of long term complications, including some very dangerous disease. I reported chronic traumatic encephalopathy ( CTE ), sleep disorders and depression, which are causing an ongoing debate in some sports ( NFL first of all ) on the necessity to change rules and gears in order to protect athletes from late life diseases and sleep disorders, which are a less known and more common problem to those who have experienced a repeated brain traumas history. Obviously some kind of sports expose their participants to a great risk of concussion and, in some cases, concussion may be even part of the sport itself. Inquiries on long term effects of MTBI started indeed from professional boxers’ disease such as the ”punch drunk”, the early dementia pugilistica, now known as CTE. In recent years there has been a lot of debating in American football about concussion and its long term effect, surely due to millionaire lawsuits on behalf of former players with some form of concussion-related pathology. However, the results of this debate are encouraging: a culture of change has been leaded to decreased the risk for players and augment their consciousness. Even improvement in technology may help in this “battle”. New helmets designed to reduce counterblow and register impact force have been on study (even though is suggested that a return to leather helmets may be more helpful), high school teachers are instructed to recognize and give a early treat to concussed young athletes. CTE is a form of encephalopathy found only in subjects with a history of repeated concussion. It is a progressive neurological disease, first discovered in 1928, when Martland described a symptom spectrum in boxers, which he termed punch drunk. This condition appeared to be the result of repeated blows experienced in boxing: this because the punch drunk was more commonly found in boxers with a fighting style that included significant head punishment. In 1937 the term dementia pugilistica was introduced by Millspaugh to describe the syndrome, typical of boxers, characterized by motor deficits and mental confusion. In 1973 the syndrome was defied as a distinct disorder and named CTE; further studies established that, after its initial description as a boxers’ pathology, CTE was not solely limited to the boxing population, but a wide range of people with a history of repeated concussion may show clinical symptoms related to CTE. Despite the association between exposition to concussion and CTE, the exact relationship between TBI and CTE is not clear. It has been hypothesized that repetitive axonal stretching and deformation caused by traumas may trigger a neurodegenerative cascade, particularly in individuals with previous unhealed brain injuries. Reduction in brain weight, associated with atrophy of the frontal temporal cortices and medial temporal lobe. Enlargement of lateral and third ventricles. Fenestration in anterior cavum septi pellucidi. Pallor of substantia nigra and locus coeruleus. Atrophy of the olfactory bulbs, thalamus, mammillary bodies and cerebellum. Thinning of the hypothalamic floor. 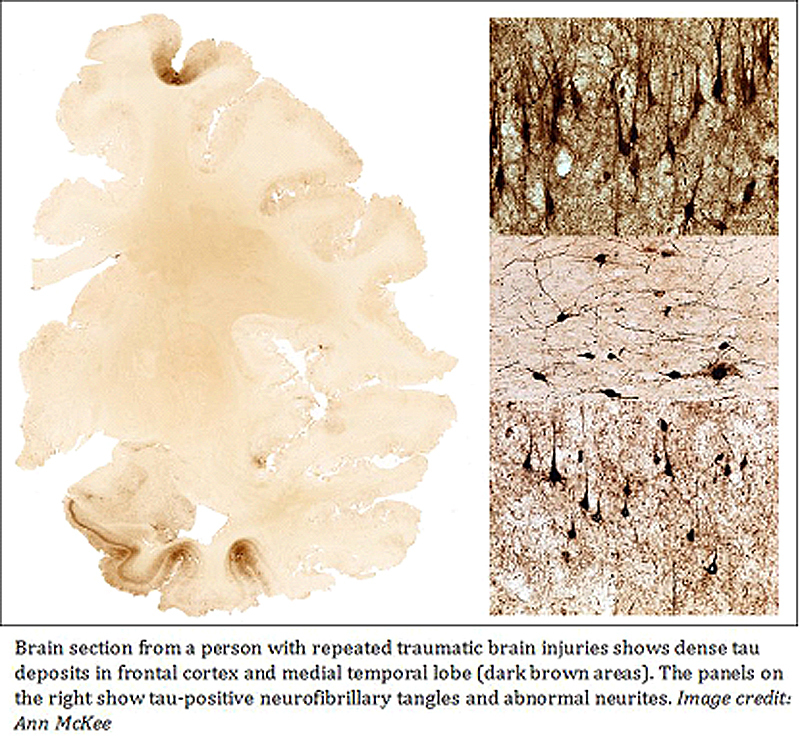 On microscopic scale CTE is characterized by a unique pattern of changes. Extensive tau-immunoreactive neurofibrillary tangles (NFT). Neuropil neuritis and glial tangles in the frontal and temporal cortices. Tau immunoreactive abnormalities tend to cluster at the depths of sulci, around small vessels and in superficial cortical layers, making this disease different from Alzheimer disease and other taupathies. 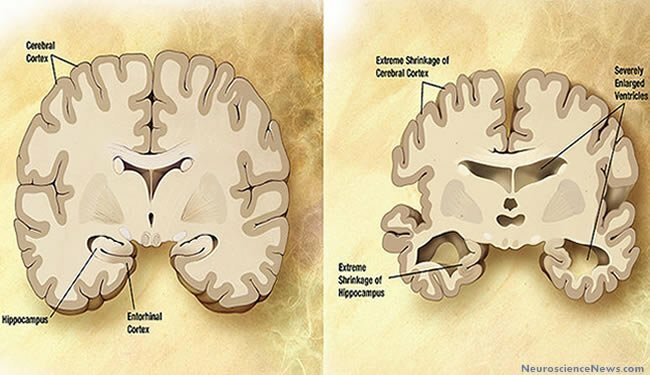 Importantly, these changes seen in CTE usually occur in the relative absence of beta-amyloid (A) deposits. CTE cases are also marked by TDP-43 proteinopathy. The TDP-43 inclusions are widespread and typically found in the brainstem; basal ganglia; diencephalon; medial temporal lobe; frontal, temporal and insular cortices; subcortical white matter. CTE symptoms usually presents in late midlife, years or decades after the end of exposure to repetitive brain injuries (ie, retirement from sports). When there is a sufficient disruption of normal neural activity, symptoms related to the area of neuronal degeneration will show. It is unclear whether symptoms may be helpful for doctors to spot early CTE. Symptom progression is slow and gradual, it may require several decades to reach severe symptoms such as greater memory problems, language difficulties, aggressive and irritable behavior, apathy, motor disturbances (including parkinsonism) and dementia. Early symptoms however are less obvious and consistent with the neuropathologic changes that may be observed in a early-stage CTE autopsy: impairments in cognition ( eg, from medial temporal and dorsolateral frontal degeneration), mood (eg, amygdale degeneration) and behavior (eg, amygdale and orbitofrontal degeneration). The alteration in mood leads to an increased risk for substance abuse and suicide. A research of Omalu , who already worked on former NFL athletes with CTE, reported full forensics autopsies and immunoistochemical analyses of brain of 5 professional American contact sport athletes who committed suicides and parasuicides. In all these brain signs of CTE were found. As stated above, the primary risk factor for CTE is a history of repetitive concussion. All neurologically confirmed cases of CTE had this type of history. The increased ratio of diagnosed CTE in professional boxer than in amateur boxer confirms this hypothesis, as the differences in rules during a professional or amateur match lead to a different exposition to head traumas. However, repeated brain injuries are not sufficient to cause CTE, as not all individuals exposed to brain traumas develop CTE. An important potential risk factor may be genetic predisposition. Preliminary studies linked apolipoprotein E gene, specifically APOE e4 gene, to worse cognitive functioning in boxers and professional football players, and to prolonged recovery after a single TBI. Case report:5 out of 12 professional football players and boxers with neurologically confirmed CTE were APOE e4 carriers, 2 being homozygous. It is suggested that age at the time of concussions may affect risk of developing CTE and its later symptoms. Younger brains recover better after a injury, although they require more time to heal, but may be more susceptible to diffuse brain injury, which leads to prolonged and pronounced cognitive deficits. However the relation between age and CTE onset and symptoms is not yet well understood. Gender also may be important, with women being more exposed to concussion and related symptoms. A remote history of repeated concussion may also be a risk factor for developing depression later in life. 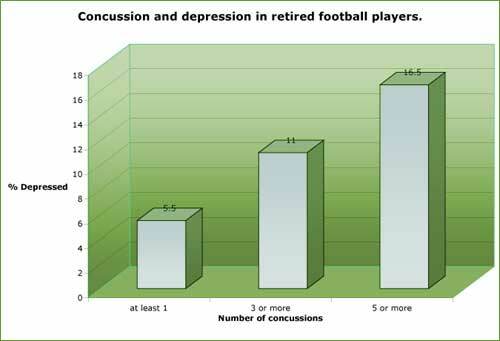 The examination of aging former athletes with current symptoms of depression lead to a significant correlation between the numbers of lifetime concussion and depressive symptoms. As the number of concussion increase, the likehood of showing depressive symptoms also increases. In particular having sustained repeated concussions in early adulthood relates to an higher risk for depression compared with the general population. Findings suggest that the number of self-reported concussions may be related to later depressive symptomology, particularly cognitive symptoms of depression. Cognitive symptoms include sadness, feeling of guilt and critical self-evaluations. In contrast, somatic and affective symptoms of depression were not significantly correlated with history of concussion. These findings are consistent with the results of a research leaded by Guskiewicz, 2007 , who found a relationship between NFL-athletes with a repeated concussion history and depression. Neurobiological and psychosocial factors may account for the relationship between brain injury and depression. For example, individuals with clinical depression have been found to exhibit structural and morphologic changes of the brain's mood centers involving the hippocampus, amygdala, and prefrontal brain regions, which may be affected after concussion. Athletes with concussion with depression symptoms showed reduced activation in the dorsolateral prefrontal cortex and striatum and attenuated deactivation in medial frontal and temporal regions. patients with head injury with depression also showed significantly reduced gray matter volumes in the left prefrontal cortex. Reduced cerebral perfusion, found, as we have seen above, in concussed patient, is also linked to depression. Omalu suggested that the mechanism of depression in patients with a TBI ( traumatic brain injury ) history may involve neurotransmitter and/or neurohumoral imbalances/depletion due to impairment of normal neuronal functioning and destruction of neurons by hyperfosforilated tau proteins in the form of neurofibrillary tangles and neuritic threads in specific brain nuclei and systems. The severity of symptoms of depression correlated with neural responses in brain areas that are implicated in major depression. Voxel-based morphometry confirmed gray matter loss in these areas. In addition, the uncertainty of prognosis (ie, lack of an active rehabilitation), removal from sport, isolation, and lack of social support in dealing with concussion may influence mood in athletes with concussion. Females are more exposed to the risk of concussion-related depression than males, even though this augmented risk may be due to the major predisposition of females in reporting such kind of symptoms. Also, the younger the age, the higher the risk of developing depression. Sleep disturbance is a common complaint after head injury, with milder injuries more likely to disrupt sleep than more severe head trauma. Sleep disturbances are estimated to occur in 30-70% of head-injured patients, often impairing the resumption of normal activities. A study leaded by Baumann and colleagues following patients who had been hospitalized for TBI discovered that 3 out of 4 patients developed sleep-wake disturbances by six months after the injury. Most had hypersomnia and/or fatigue, with insomnia in only 5%. The type of sleep disturbance resulting from a head injury depends on the location of the injury within sleep regulating brain regions. These regions include the brainstem reticular formation, posterior hypothalamus and the area surrounding the third ventricle. For example insomnia is a common symptom after injuries involving the base of the skull in areas of bony irregularities with consequent damage to the inferior and anterior temporal regions, including the basal forebrain (an area involved in sleep initiation). In some cases, the post-TBI insomnia is a manifestation of a circadian rhythm sleep disorder, typically delayed sleep phase or irregular sleep-wake type. Disturbance of circadian rhytmicity are related to closed head injury involving the suprachiasmatic nucleus or its output tracts. Hypersomnia with or without involuntary sleep attacks may also develop after a head injury, so called secondary narcolepsy or posttraumatic hypersomnia. Most patient with moderate-to-severe TBI have low hypocretin-1 levels in the acute phase; these low levels are found in most cases of narcolepsy with cataplexy(07)60237-2/abstract . Another pattern after TBI includes difficulties initiating and maintaining sleep, with or without concomitant daytime sleepiness. Head trauma occasionally triggers parasomnias , including sleepwalking; sleep terrors; rapid eye movement sleep behavior disorder (abnormal dream-enacting behavior during a normally atonic state); and dissociative disorders. In addition, TBI may worse preexistent Kleine-Levi syndrome . Post TBI sleep problems are often refractory to conventional treatments. Drugs and cognitive behavioral therapy are both used to treat insomnias and hypersomnias, while parasomnias requires just behavioral approaches and elimination of parasomnia inducing conditions, such as substance abuse, medications, alcohol use, stress or illness.